If you find yourself as the complete opposite of organized, you may be wondering how those people manage it. Some people just seem to be effortless in their organization. They always arrive on time, they have everything put away, and they always seem to know what they’re doing. For the rest of us, even getting out of bed and dressed for the day can be a battle of chaos and confusion. The truth is, the people who are more organized practice habits that the rest of us don’t – and they stick with it. If you’re looking to be a more organized person, you may want to mimic the habits of highly organized people. They can help you get your life back together, and become a more organized you. If you live with roommates or a family, waking up about 15 minutes before the rest of your household can make a big difference on your ability to get ready in the morning. You won’t be fighting for bathroom space or the shower, because you’ll already have a head start on the rest of the people in the house. If you live alone, waking up 15 minutes before when you normally would can also give you just the amount of leeway you need to make sure your morning starts out right. Fay Wolf, author of New Order: A Decluttering Handbook For Creative Folks (And Everyone Else) says “I recommend not keeping your cell phone in your bedroom when you go to sleep…” With so much available right on our mobile devices, it’s important not to get caught in the trap of lying in bed scrolling through your phone the first thing after you wake up. Before you know it, you’ll be running late. Instead of immediately reaching for your mobile device, try some breathing exercises to help ease you into waking up. You’ll feel happier and more relaxed, ready to get out of bed and start your day. In the morning, give yourself a small time frame to do something that you really want to do. This could be drawing, reading, listening to music, or even giving in and scrolling through your phone. However, there needs to be a time limit. Only allow five to ten minutes of this indulgence before getting on with the rest of your morning. You’ll get a boost of energy from doing something you enjoy, while still keeping yourself accountable and on track. 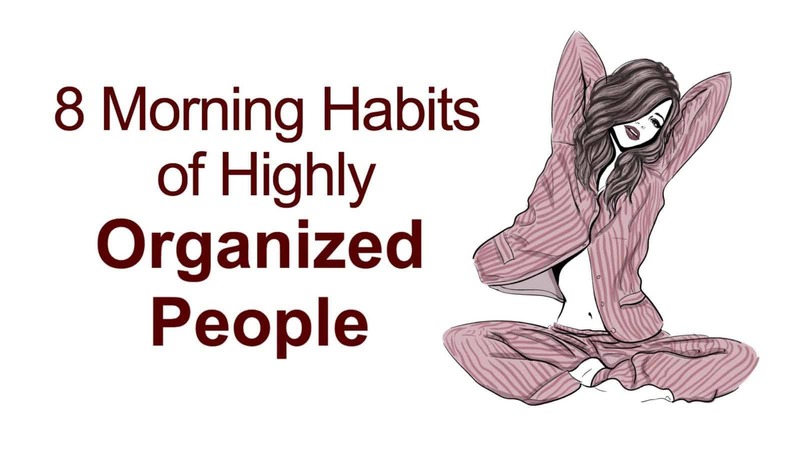 Organized people complete their morning routine in the same order every single day. The more that they complete their routine in the same order, the easier it’ll be to get up every morning and keep the rhythm. When you start to do this, you’ll find that it takes less effort to get out of bed and get everything you need doing in the morning done. This means that if you’re chronically late, you’ll start to be more organized and on time. Trying to change your entire routine at the drop of the hat may only lead to more stress. However, setting realistic goals will help you achieve all the things that need to be done in increments. Work on one habit that you want to change, and once you have that down, you’ll be ready to move onto the next one. Once you have a habit established, you won’t have to work on keeping it, which will give you the power to start working on another one. Organized people keep realistic goals for themselves so that they can stay on top of things without worrying. Putting together a meal can take a lot of time out of your morning. It’s easier to have food prepared the night before. Organized people may even prepare a large amount of food for the week and keep it stored in the fridge or the freezer so all they need to do is take it out or heat it up. You’ll be more organized and ready to go when all you need to do is grab a prepared meal out of your fridge and get going. If you have a habit of putting everything out on your bed while you’re getting ready in the morning, you may know the distinct feeling of coming home to a bed that’s not ready for you to just flop down in. Decluttering areas of your house before you leave ensures that once you come home, you’ll be ready to relax or get some real work done. Instead of putting off a daunting task, organized people take the plunge and complete the task that they don’t want to do first. Then, they won’t be focusing on how much they don’t want to do it later on in the day. This makes for a more productive work day, without any added stress anticipating when they have to work on a dreaded or hard project. A lot of us are unorganized, partly because we’re not sure which habits work best for us. Highly organized people practice good habits that make their days easier and more time efficient. If you’re struggling to stay organized and make your day easier for yourself, you may find any or all of these habits beneficial to you. Who knows? In time, you may also become a highly organized person!